Leading or taking short-term mission trip? Check out this guide to leading or successfully going on a short-term mission trip. 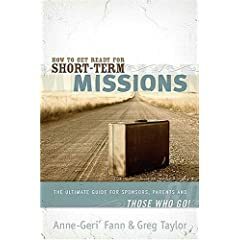 One of the items comes from Angie Fann’s and my book, How to get ready for short-term missions. The article discusses four keys to your trip. The Taylor family plans to be there May 25-June 14 to reunite and see good things “flowing out” of the Source of Life Resource Center. It’s named “source” because it’s within a mile of the famous “Source of the Nile” where we lived 1994-2001. SPC Tike Danson Alford Chapman, father of sons 4 and 6, died April 23 and the obituary is in the Tulsa World today. This is a notable obituary for several emphases and worth a read. Note his devotion to serving his country, his Pawnee Nation, family, and attention to extended family and ancestry. The Tulsa World’s “Our Lives” Obituary section is one of the best I’ve seen, with extended obits and stories of lives of famous and not famous but extraordinary people. My family lived in Jinja, Uganda seven years and worked with a church planting team and local Ugandans to establish village and town churches. Jill, Ashley, Anna, Jacob, and I plan to return for a short-term mission trip this summer. We are very excited about going back to our second home that has meant so much to us all. This is sort of a pilgrimage for our family with specific goals for our trip that we’ll detail below. •Visit and fellowship with our Ugandan friends we love so much. •Reconnect Ashley, Anna, Jacob with their childhood home–birthplace of Anna and Jacob. •Visit and encourage current missionaries, Bobby and Candice Garner, who have been supported by The Kibo Group and Garnett Church of Christ. A special thank you to those of you who have sacrificed your time, energies, and money to help make the whole mission in Jinja, Uganda a way of hope for Ugandans. We love and miss our Ugandan friends, the churches we shared life with, the missionaries who have taken the baton. Ugandans and Americans together have moved the mission toward sustainability and continued spiritual and physical development, with more than 50 churches, The Source of Life Cafe, Basoga Bible School and many other projects such as the Mvule Tree Project, Water Source, a well-drilling project, both sponsored by The Kibo Group (www.kibogroup.org). We have bought plane tickets and are committed to paying for as much of the trip as possible, but this trip is too big to keep to ourselves and we gladly accept any donations you want to give. You can send tax-deductible donations to “Garnett Church of Christ” and write “Taylor–Uganda” on the memo and send to Garnett Church of Christ, 12000 E 31st St. Tulsa, OK 74146. You’ll receive a tax letter at the end of 2010. As thanks for your donation,we’ll send you a copy of the novel, High Places, a coming of age adventure and love story set in Uganda in the 1920s. I thought a lot about my friend Daniel Mwaza today. Daniel is 6’4″ and has size 14 feet and for the 16 years I’ve known him, he’s walked around and worked barefooted. He’s about my age and chooses not to wear shoes. Today, I chose to go barefooted to remember him, to remember the children who do not have shoes any day. Many children in the world–places like Uganda where Mwaza lives–can’t choose to wear or not to wear shoes. They simply have no shoes. Walking around barefooted allows worms to bore into their feet, and it makes them sick. Toms shoes is a great idea and venture to provide a pair of shoes for needy around the world with each pair of shoes you buy. Two Smiths: Rich and Lee--related by boots and Christ. These here are two of my good friends Rich and Lee Smith. No relation, these two Smiths. They are only related by Christ and their boots. Rich liked Lee’s boots, some vintage boots from the 60s that look like they were shined right out of the factory yesterday, only they are beautifully broken in and freshly soled. When we were together at the Zoe Conference last October 2009, Rich played some beautiful music on Larry and Linda Bridgesmith’s piano, and he had a great message at the conference about what God is doing in a bunch of folks in Lubbock–other good friend, Dr. Mark Hall, joined that bunch of disciples of Christ who meet in Lubbock. Back to the boots. Lee gave Rich his boots. Here’s a photo of Rich wearing them. Beautiful boots and beautiful friendship. 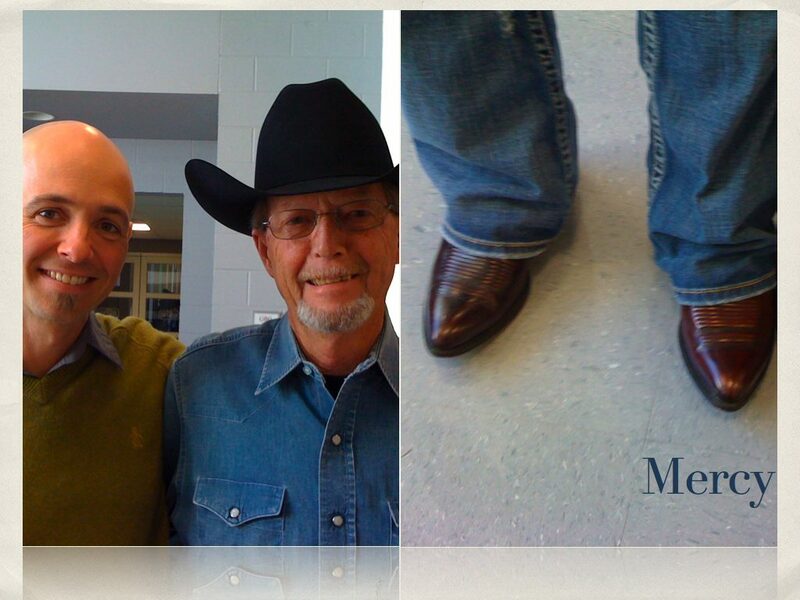 I believe God has gifted Lee Smith and Rich Smith with many Spiritual Gifts, but this meeting that I witnessed, this exchange of boots, was a simple act of love. I’ve seen Lee touched by so many people and respond with action and heart-felt emotion. I truly believe God has gifted Lee with a Spiritual Gift of Mercy. I truly believe God has gifted Rich with a Spiritual Gift of Music. I know that’s not officially listed as a Spiritual Gift, but as my shepherd John Dickmann says, the Holy Spirit just got the list started through the writings of Paul. There are many ways beyond that list that the Holy Spirit gifts us. From Left: Fredrick, Jill, Kate, Ashley. Bottom photo: Anna with goat and friend Alex. These photos were taken in the mid-90s. I believe my wife Jill has a Spiritual Gift of Teaching. She has used that gift throughout her life to build up the body of Christ, teaching and mentoring young and old alike. Jill teaches children at Garnett and also teaches college age and high school age math courses at two Tulsa area schools. 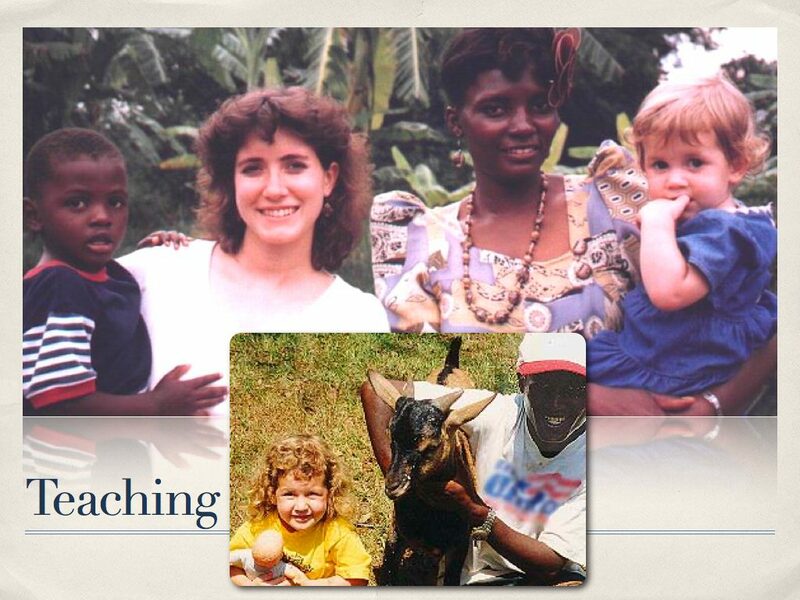 The picture to the left was taken in the 1990s when we were in Uganda. She is standing with Kate Katono Muwanguzi. Jill and Kate are holding each other’s children and loved one another’s families very much and cared for each other and mentored each other for seven years when we lived there. We are returning to Uganda to visit our friends like Kate and many others in village churches and the church in Jinja, Uganda in May-June 2010. My son Jacob Taylor was baptized Sunday, March 28, 2010. I told Jacob, “God said he is pleased with his Son Jesus–I am also pleased with you, very proud of you.” Jacob has such a great heart. I told him I already consider him a Christian, that this baptism is a marker on his journey. He loves God and has been seeking Him since he could fathom a Holy God, an incarnate Christ, and a Holy Spirit. I’m very proud of my son Jacob and honored to have baptized all three of my children–Ashley, Anna, and Jacob–at Garnett Church of Christ. Mom is not pictured but behind the camera. Roy Mwesigwa was our special guest from Uganda, where Jacob was born. What a great day!